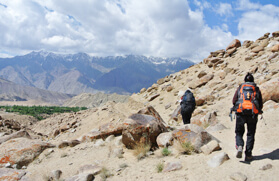 Possibly one of the easiest treks in the Ladakh region, the Sham Valley Trek binds one's heart and soul with an unparalleled phenomenon of nature and culture. 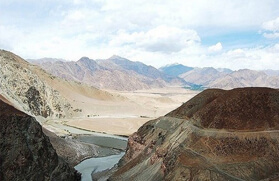 It sheers into the famous Apricot Valley of Ladakh peeling off the ethnicity of the Ladakh village life, ancient monasteries that reflect the everlasting footsteps of different sects of Buddhism and untamed streams cutting across the valley. A dynamic full of life beginner won't find any challenges while on his journey through the paths and pace at an average elevation of 4,500 meters. The Sham Valley Trek leads off to Yangthang after a gradual descend to Phobe La at 3,580 meters from Likir and thereafter heads up to Chagatse La, which is at an elevation of 3,630 meters. The Ridzong Monastery that lies about an hour's distance from Yangthang and passes through a narrow gorge is one of the major attractions on this trek. The trek from Yangthang maneuvers to Hemis Shukpachan across Tsermangchan La, which is at a height of 3,750 meters. On this route, the village that is often dubbed as grove of cedars is one of Ladakh's comeliest. Further one will come across several sparkling streams surrounded by shady willows and large barley fields that provide a touch of green to the otherwise desolate, rocky Mountains. The trail thereafter ascends between two hillocks to the west until it veers south and climbs steeply up to the Mebtak La at 3750 meters dotted with prayer flags. From the pass the journey to Ang, which ushers with apricot orchards, swerve through a gorge. Finally, the trek downhill to Temisgam widely displays the local culture of the Indo-Tibetan sects. The Sham Valley Trek is also known as a Baby Trek that covers a distance of approximately 30 kilometers from Likir to Temisgam and takes 4-5 days. The best season to backpack for this trek is anytime from, June to the first half of September. Today is an easy walk despite the pass because both the approach and the descent are of gentle gradients. The trail heads north,descending for a bit, crossing a stream before climbing up west again to Tsermangchen La (3750m). After a short rest at the pass we head down to Hemis Shukpachen. The village, named after the grove of cedars, is one of Ladakh's prettiest. There are several sparkling streams surrounded by shady willows and large barley fields that provide a touch of green to the otherwise desolate, Rocky Mountains.